Labrador training is obviously an essential step to take but beware; while you are trying to train your dog your crafty Lab will be working just as hard to train you! Labradors are incredibly intelligent but are very advanced in the skill of selective hearing. Prepare yourself for a battle of wills. Your Lab will respond very eagerly and correctly when you command – if he wants to. If he doesn’t his selective hearing will click in and he will completely ignore you whilst still managing to look you in the eye whilst putting on the most adorable of faces. This is when you need to be strong! Labrador training is fun and mightily rewarding; but it isn’t easy. Your Lab will be working just as hard as you to get the regime he wants. It’s a battle for supremacy. Who is going to be the Alpha in your pack? You or the dog? On the pages of this site we’ll outline numerous hints, tips and techniques to ensure it is you that is the dominant party in the relationship. Or at least that is the plan! We’ll also review some of the home training courses available over the Internet and keep you informed on the successes and mistakes we make while training our new Labrador puppy; Whiskey. Whiskey is already showing contrary signs of being a complete nutcase (in the photo he is having a tag-team wrestling match with Darcy and a plant pot) whilst having a great level of intelligence. The battle lines have been drawn! On other pages we will go into detail on all the various techniques of Labrador training but firstly a word about socialising and puppy clubs. A Labrador will only benefit from regular contact with other dogs, either at home or at a regular puppy class. 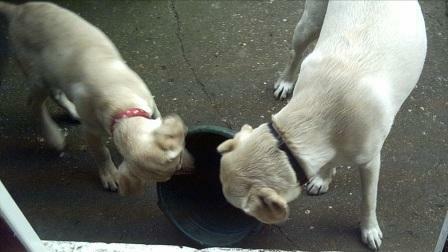 Labs are very social animals and will love contact with other dogs and people. Attending puppy classes from an early age will also encourage your Lab to learn obedience and some commands. One hugely important thing to remember is to always be consistent in the commands you use; they must always be the same at home as at puppy class and regardless of which human is with the dog at any one time. We always find it useful to write down the commands. Using commands such as ‘stay’ and ‘wait’ interchangeably will only confuse the dog. A specific action must always be associated with a specific command. Another hard and fast rule for Labrador training is never, ever lose your temper. A dog, even one as intelligent as the average Labrador, can easily become confused when training. It is most important that any frustration on the part of the trainer is contained, any show of anger can irreparably harm a Lab. They are sensitive creatures and the worst punishment you can met out is to ignore the dog. There is no need for anger or frustration. If the dog is choosing to disobey commands pop him into his crate and leave him for a while. Silent isolation is much more effective than screaming anger. Besides, who on earth could be angry with such a beautiful animal as a Labrador?